my lowercase life: Do You Have What It Takes To Be A Pimp? Do You Have What It Takes To Be A Pimp? Apparently I would make an excellent pimp. My roommates and I were sitting around the table making Wiskey and Brandy Old Fashioneds to see if we liked them, when all of sudden the topic of pole dancing and pimps came up. (I don't even remember how or why, so don't ask me) We are all laughing and joking when suddenly C stops the conversation "WAIT!" and points at me with a straight face and very seriously says, "Luna, you would make a great pimp! You are so organized!" The room went real quiet for a minute as we stared at her and then we burst out laughing as C tried desperately to argue the seriousness of her point. Then, a few days later we are sitting in the living room when Mona comes running down the stairs. "C?! What is this video on your Snapchat Story!?!?" Mona holds out her phone and shows us all the video. It's C sitting with her friends having a very serious conversation about how I would make an excellent pimp because I'm so organized. She just can't stop talking about me being a pimp. First of all, thank you. As I look around at my mess I seriously doubt my organization skills, but I must be doing something right to trick you into believing this. 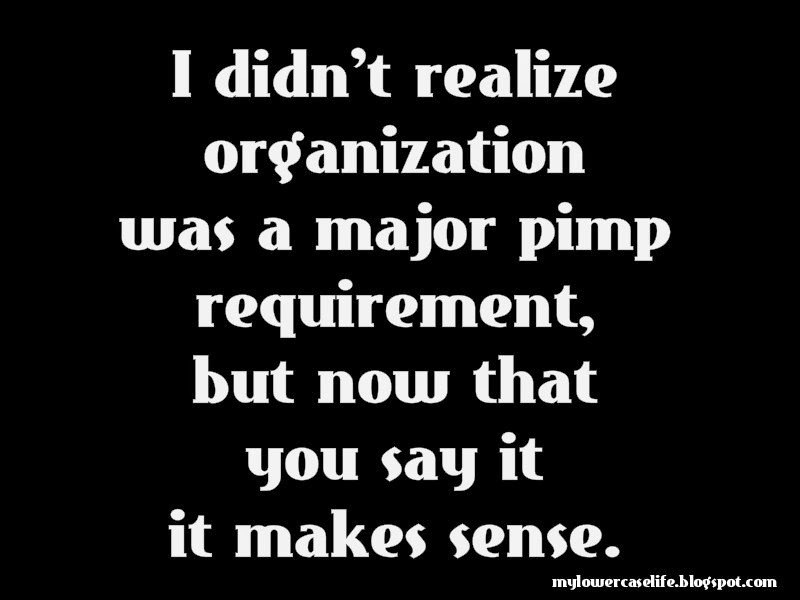 Second, I didn't realize organization was a major pimp requirement, but now that you say it it makes sense. Third, I think you talking about me being a great pimp over and over implies that you are asking me to be your pimp. Are you in some kind of trouble? Do you need help? Fourth, Mom, I think I might be changing my life plan.